"I think when you're growing up in your teens, you don't want to say you dad's a chimney sweep. But when you start going to work, and people say 'what do you do?' you say 'guess'. And they never guess what you do. And when you say 'chimney sweep', they're like 'I didn't know that existed!'". Ricky White always wanted to be a sweep. 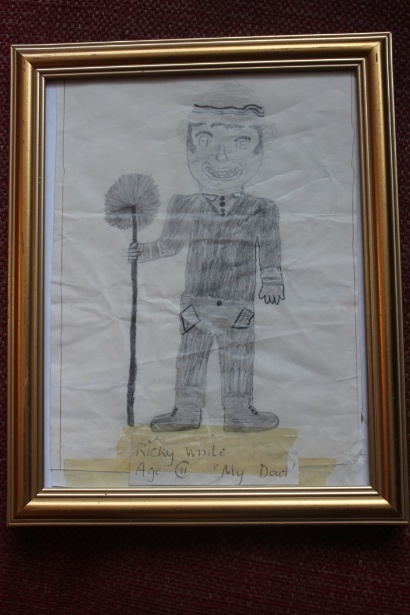 There's more than a hint of this in the picture he drew, aged 11, of his father — proudly titled "My dad". "You really only become a chimney sweep because it's in the family," says Ricky. "It's not like you go to the career office, and come out a sweep," chips in Tony White, Ricky's older brother. The two are sat with their dad, David, in his surprisingly immaculate living room in Swanley (only later do we clock the black soot smudges around the door frames). 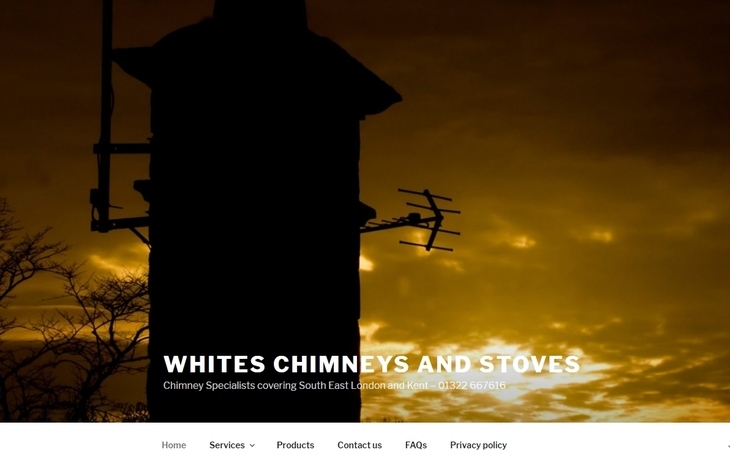 All three work for Whites Chimney and Stoves, between them, covering much of south east London, Kent and parts of Surrey. Theirs may be a profession that peaked in Victorian London, but it lives on — and is now enjoying a semi-rebirth, as woodburners and fireplaces become de rigueur once more. Whites has been going since 1953, when David's dad Tom ("a cross between Tony Hancock and Harold Steptoe, a snob at heart, but a lovable one") accepted his true calling. "He had a good voice," says David, "always singing while he was working." "For about six years he went into opera. And did piano playing. He was a frustrated musician. And frustrated singer. And frustrated chimney sweep!" But soot's been in the family blood longer than that; David's grandmother's side of the family — the Brooks — swept too. Her father, Tom Brooks may have sported a blackened face and hands, but he had a pure enough soul. He was a vestryman, not to mention a mouthpiece for the temperance movement in his native East End. So respected was Brooks in his day, he became Mayor of Bethnal Green in 1931. 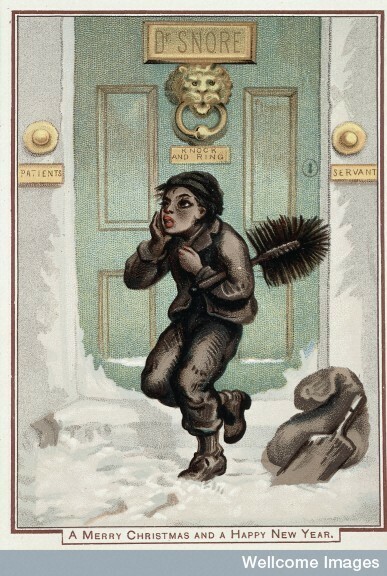 There is a striking picture of Brooks as he walks the streets of the East End — his cap, face — even teeth coloured in with soot; his back bearing a bundle of rods; a gaggle of flat-capped onlookers gazing upon him like he's some deity. Mayor of Bethnal Green he may have been, but Brooks never hung up the brushes. Indeed, the story goes that he was invited to a tea party at Buckingham Palace in his capacity as mayor, and still fulfilled his sweeping duties that morning. "I don't know if he turned up at the palace looking like a sweep!" laughs Tony. Brooks was apparently responsible for moving Brick Lane's Sunday market from the northern end — something that didn't go down well with all the locals. If it hadn't been for who Brooks was, Tony suggests, he'd have been beaten up. "The villains, the gangs — they all respected him," says Tony, "He wasn't frightened of them. He'd sit outside his house on a Sunday, and people would come up to him and debate things with him." While Tom Brooks probably swept 10 chimneys or so a day on the same road, Whites cast the net much further. 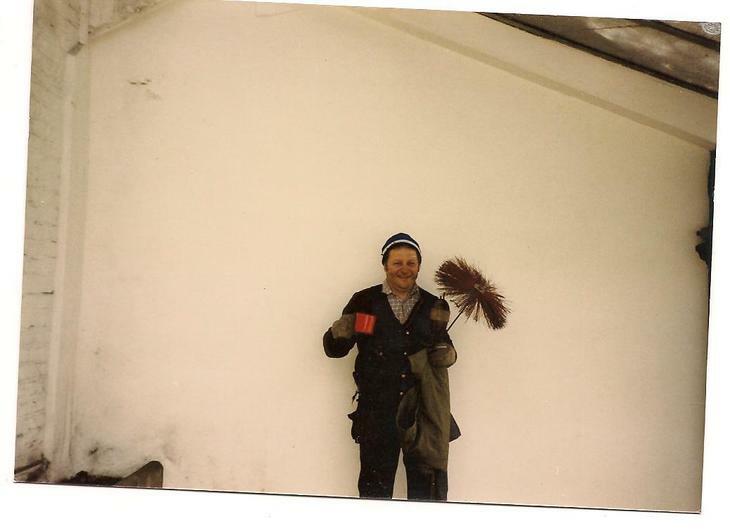 "We've got vans, whereas he would have walked to a house with his rods, cleaned the chimley, walked to the next house round the corner," says Tony. ("Chimley" and "chimney" are interchangeable in the family's parlance, although when we point this out, they say they've never noticed). But has anything in the nature of the actual sweeping changed? 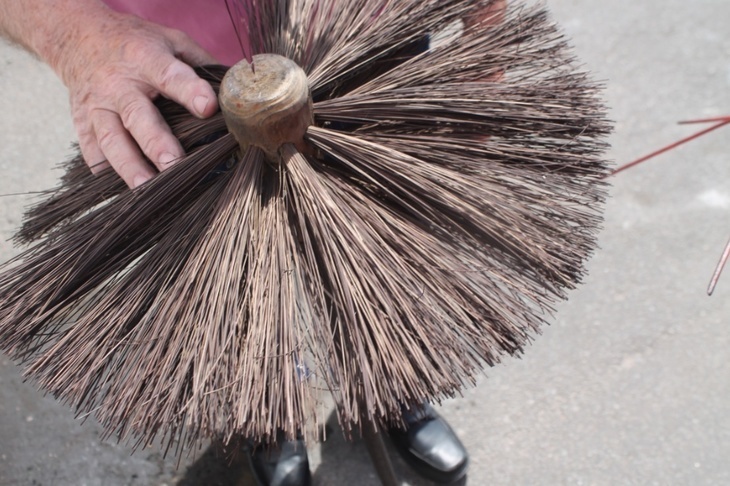 "Sweeping has always been rods and brushes", says Tony, "but the equipment's got better". The modern, tough plastic brushes (David keeps an old horsehair brush for nostalgia's sake, and sometimes lends it out to kids for school fancy dress) are fitted to a power drill — so you can clean at a zippier rate. A vacuum also helps stop soot and dust escape around the room. 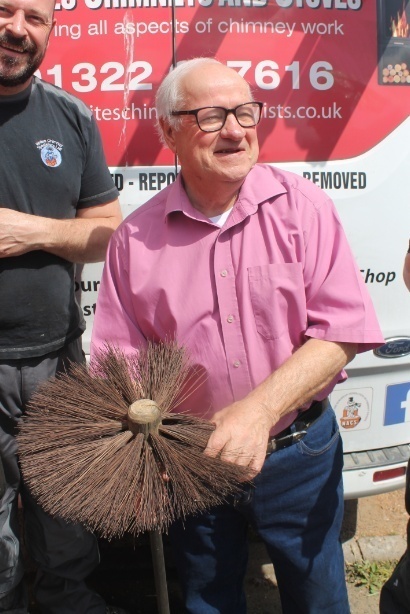 That doesn't stop customers being paranoid; "Sometimes you're filthy dirty and you stink of soot," says Tony, "and you turn up in someone's house and they may say to you straight away 'are you going to make a mess?'" "Tom may have come along and made a load of mess. Where as nowadays, we can't get away with it. You're expected to keep the soot and dust contained." So in all their years on the job they've never created a Laurel and Hardy-style scene? 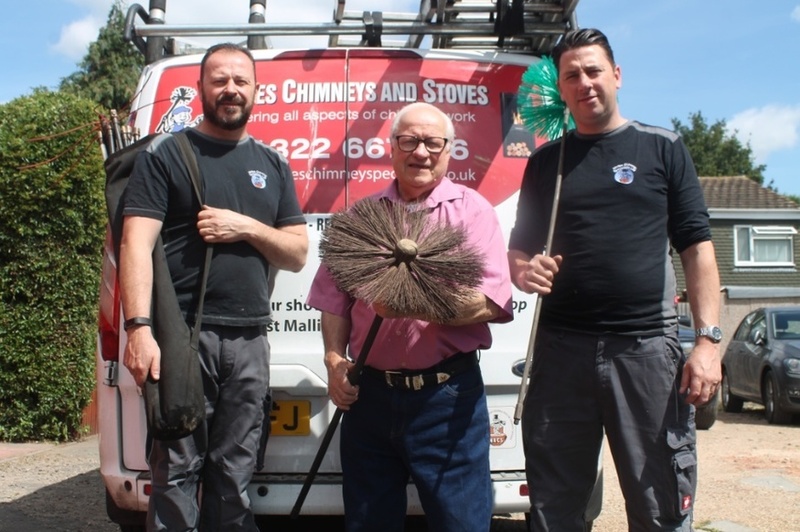 "Out of the hundreds and thousands of chimneys, you're going to get one or two that are a disaster," admits Tony, "You never know till you clean a chimney, how bad it's going to be." This prompts David to remember a job in Sutton years ago, where the vacuum bag had been perforated. "Tony didn't know it was happening," laughs David. "The bloke, he had a temper. He'd gone out, left us to it — he come in the room, and he just went like that [mimics touching dust with fingers]... and then he went bananas. He said 'I hope you're insured.'" "He was so angry, he walked down the garden to cool off and I thought 'that's just what we need' and we went bananas with the hand brushes, all round the room. And in 10 minutes, it was amazing what we done. I was panicking at the same time though." Archaic traditions must keep up with the times. But as chimney sweeps, they still get covered in soot? "Only on a good day, yeah," says Tony, "If you come home clean, your wife will say 'why are you clean?'" While sweeping may be the bread and butter of the business, each generation has branched out, adding news skills to the portfolio. The proliferation of gas boilers in the 1970s triggered a steep decline in real fireplaces, yet rising gas and oil prices have since put woodburning stoves back in the picture. Of course, these, and open fires, are back in vogue too. "The difference with our life now," says Tony, "is we have something because we want it. Whereas they had it because they needed it — they had no central heating." "You had to have a coal fire, otherwise there was no heating. These days it's a luxury, there's a romantic side." Ironically, Whites also specialise in the structural job of taking chimneys out. Not everybody needs them. "However," says David, "we often reinstate chimneys back to how they were before they were taken out perhaps 30 or 40 years previous. Or, from time to time we actually build a chimney or install a flue system, normally on the outside of a house, if we are fitting a stove or fireplace if the house has not been built with a chimney flue." The act of sending young boys up the chimneys might have long been banished — but both Tony and Ricky know a couple of lads they hope will continue their business. "My son, Harry, is leaving school next week," says Tony, "and my brother's got a son leaving in about six years time. They're the next generation. My boy's strong and doesn't mind getting his hands dirty. You're either that way or you're not." Whites, it would seem, are always that way.